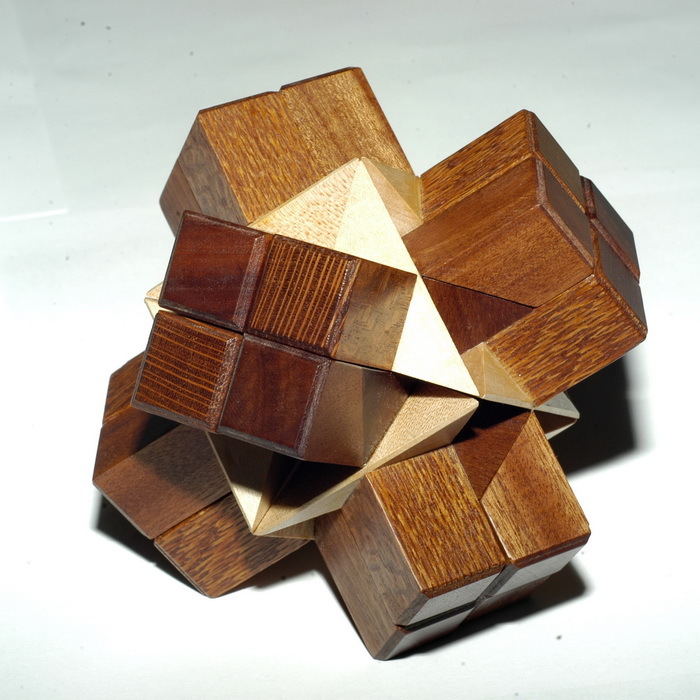 Cube:white maple and the Sticks are lacewood and kotibe. The name Illusion is because "its not what it looks like and for some strange reason i came up with this design in just a few days. It was all clear in my mind and when i made a prototype it took me one and a half hour to assembly it. I was very angry and i couldn't think correct. That's because i tried something new while i was making the structure of the pieces. And it really worked. I was almost convinced to the point that there was no solution to it and that i had to change some pieces. But... in the end all went ok. It was just me being frustratedSee more pics of the "illusion" puzzle.or Back to puzzle index.